Bye bye 2017. You have not been my kindest year. You have, however, left me with some very vibrant socks. I basically see these as my ‘fvck you, 2017’ socks. Bought the yarn a few days after Dad died, worked on them while Mum was recovering from her operation and after we got news about her cancer, and finished them in time to wear on Christmas Day. I hope they won’t always remind me of very tough times, but instead will make me think about the family that I love who I was with when I knitted them, and the friends I was with when I bought the yarn. The aim was to have colours which made me smile, and they certainly do that. This Christmas has, however, been special in many ways. For the first time ever everyone came to our house for Christmas and we were hosts. Gareth and I made a proper roast turkey lunch and it was a triumph. We could spoil Mum. The house was full of people and talk and cheese and chocolates and presents. (The cat hid most of the time.) 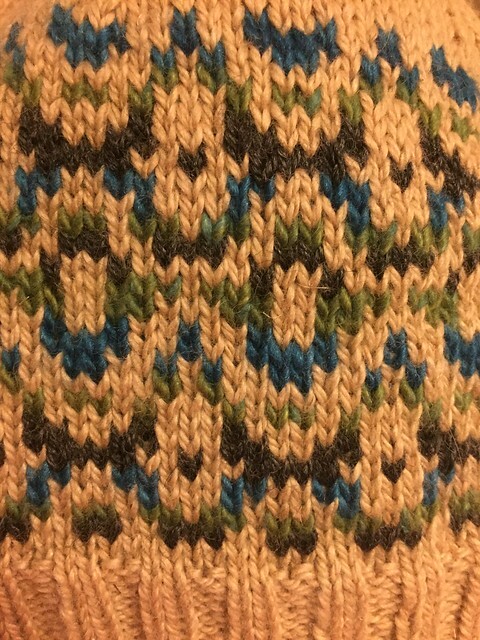 And I managed to whip up a quick FO with some help from my brilliant Mum, who doodled the colourwork pattern for me. A little early preview below, and more on that tomorrow. 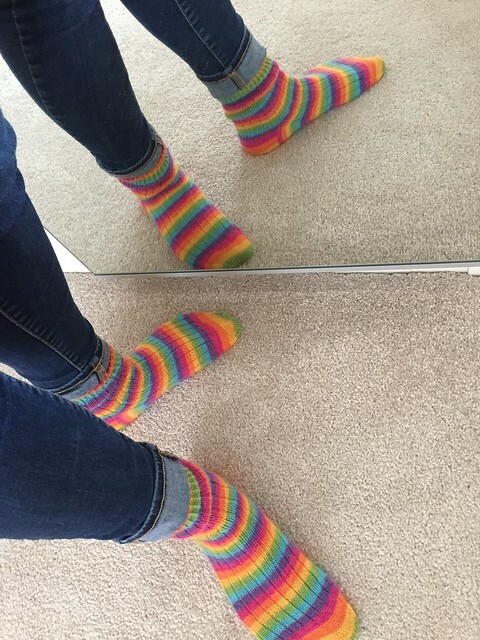 Your socks look cheerful and hope you feel comforted when you wear them. May 2018 bring you all good things. Enjoy the yarn, it is so much fun. 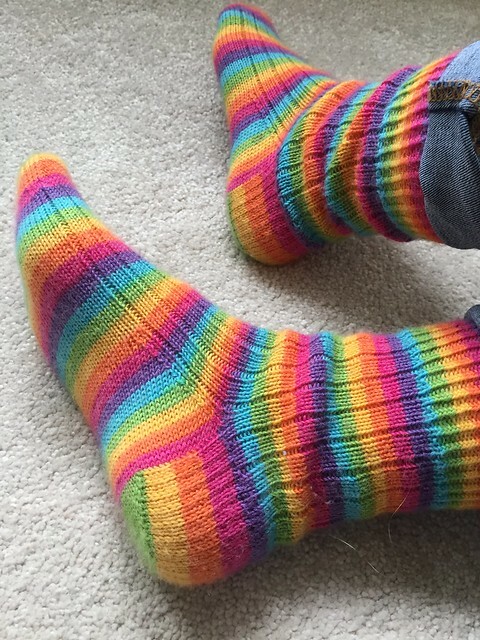 It was a little fiddly getting the stripes to match but not too bad – and I cheated underneath the heel by cutting out a section of yarn to make the progression down the foot work properly, so on the second sock I could match the foot bit perfectly. I’m so glad you had a happy holiday filled with good eats and those who you love. 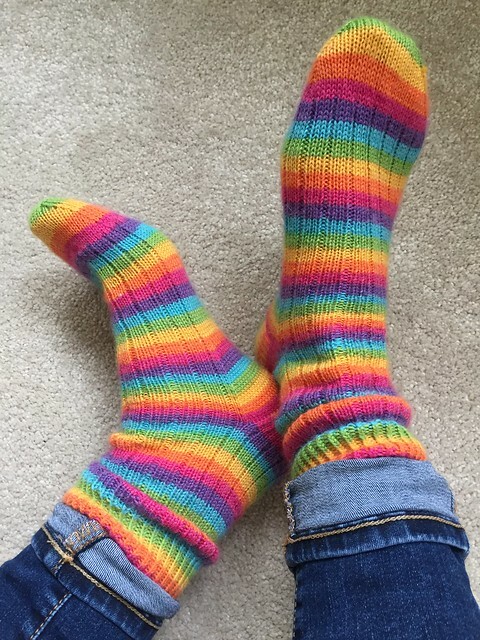 These socks are you all banded together in love no matter what was thrown at you. I’m sorry to hear about your dad. I don’t know if you’re religious (I’m not), but the rainbow in the Bible was a sign of hope. Maybe the sunglasses socks are just an expression of hope in knitwear? Oh, that is a lovely way of looking at the feeling behind this project. Thank you.